In the world of major sports and non-sports events, there are often competing claims on which is the biggest. The Olympics or Football World Cup? The Rugby or Cricket World Cup? Coachella or Tomorrowland? But how do you measure size in a business where revenue or market share is not always the primary drivers? Is it by the number of attendees, YouTube views, Facebook fans, or Google search volume? Most often, size is relative to the interests of the individual fan or spectator. A cycling fan will value the Tour de France over Super Bowl. For sponsors, advertisers and rights holders, understanding the impact of a major event is essential to value their investments. As major events look to establish themselves and their host cities as global brands, digital channels increasingly provide greater access and opportunity than physical attendance. For example, Wimbledon has around 3.6 million Facebook fans and 2.4 million Twitter followers, while the 2016 event was attended by just under half a million spectators. 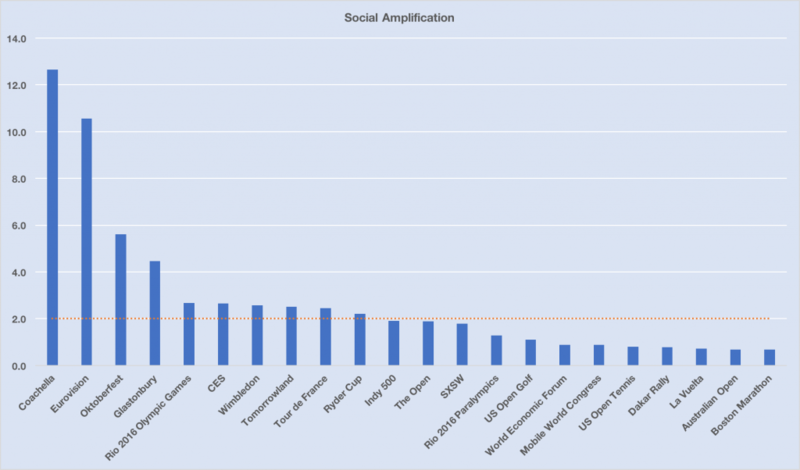 In 2016 we measured the Digital Impact of more than 100 events, leagues and championships by measuring changes over time to social mentions, followers, web traffic and search results to determine their relative size and impact. These metrics were combined and weighted into a single Event Digital Impact index. 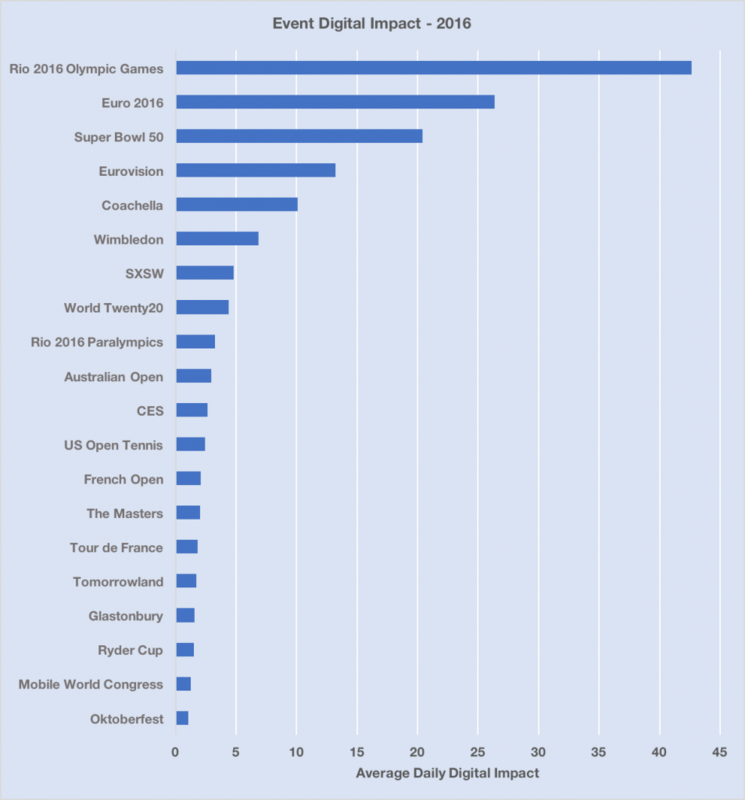 As expected the Rio 2016 Olympics was the biggest major event (or the only mega event) on the planet in 2016. Its average digital impact daily during the games was more than 60% higher than the UEFA Euro 2016 and more than double Super Bowl 50. However, Euro 2016 which spans 31 days compared to 17 for the Olympics had a cumulative digital impact that was only 9 % less. That’s an important metric for sponsors to consider, especially those Olympic sponsors with contracts extending to 2024 and beyond. On this basis, it would seem that the Football World Cup to be held over 32 days in 2018 will quite easily eclipse the Olympics in terms of total brand impact. Eurovision – Europe’s Super Bowl? The Eurovision Song Contest may seem like a strange inclusion, but television, social media and web traffic indicators all point to it being almost as big as Super Bowl and with more global growth potential. The major event website is under attack on multiple fronts and is struggling to remain a relevant source of information. For the Rio 2016 Olympic Games, Google delivered an enhanced search capability that provided the best place to quickly access games schedules, results, news and athlete biographies. On the social media front, Facebook Stadium and Twitter Moments both launched in 2016, and the quality of the experience will continue to improve providing less reason to visit official event websites. The Sport Bible, SuperSport, and others have used Facebook to broadcast live sporting events, attracting much larger audiences than would have been possible with traditional channels. We predict that in 2017 event organizers will start to forgo their web presence completely and concentrate their investments solely on social media. The event website is not dead yet, but the return on investment is diminishing. We defined Social Amplification as the ratio of social media impact to web digital impact for an event. This highlights which channels people are using to follow the event, and who is winning the social media battle with their peers on a global basis. 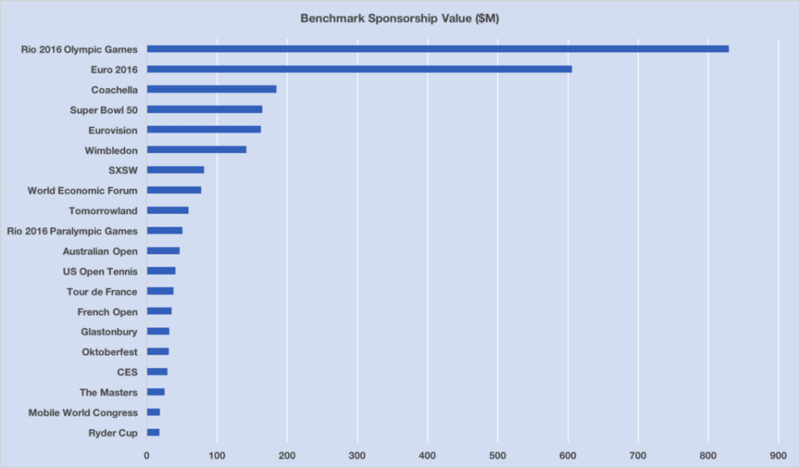 What does it mean for sponsorship? Based on the digital impact measurement we benchmarked the sponsorship for the major events held in 2016. While the type and location of an event, together with the fan demographics and physical attendance will influence a sponsor’s individual investment, it is important to know when an event sponsorship is either significantly under-valued or over-valued. While the numbers may vary somewhat it raises some interesting questions for event organizers and sponsors. Are Eurovision & Coachella in the same sponsorship ballpark as Super Bowl? Does Wimbledon’s sponsorship reflect that its global digital impact is 3 times bigger than the next major. The Paralympic Games is a major sponsorship opportunity alone, rather than as a companion to the Olympics. The benefits of measuring Event Digital Impact individually and against peers are not only relevant for big events. Smaller events at national or city level have an opportunity leverage digital channels to punch above their weight and capture the imagination of global fans. Benchmarking performance versus peers, knowing the value of your event and implementing initiatives to attract and engage new fans is essential to remain relevant in a crowded market. How big is eSports in comparison to physical sports? Which sports and events are gaining and losing market share? What is the relevance of physical attendance compared to Digital Impact? We are interested in your feedback. What would you like to see in 2017?